As the state agency, the Rhode Island Department of Health remains the first line of defense, fighting for the safety, health and wellness for the people of Rhode Island. During November 2013, Dr. Michael Fine, Director of the RIDH, asked the Rhode Island Economic Development Corporation (RIEDC) to develop and coordinate a trade mission to Israel. The mission would be ” … a great opportunity for Rhode Island and Israeli healthcare providers and healthcare-related businesses to exchange ideas and develop joint ventures.” said Dr. Fine. In the spirit of this collaborative effort, RIEDC commissioned artist Gail Ahlers to create a Challenge Coin as a commemorative gift for the occasion. 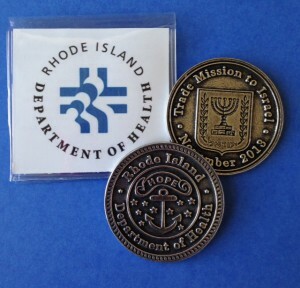 Made of hand cast pewter this beautiful, unique coin is symbolic of Rhode Island’s focus on increasing RI healthcare and economic growth. It is also emblematic of timeless perseverance. 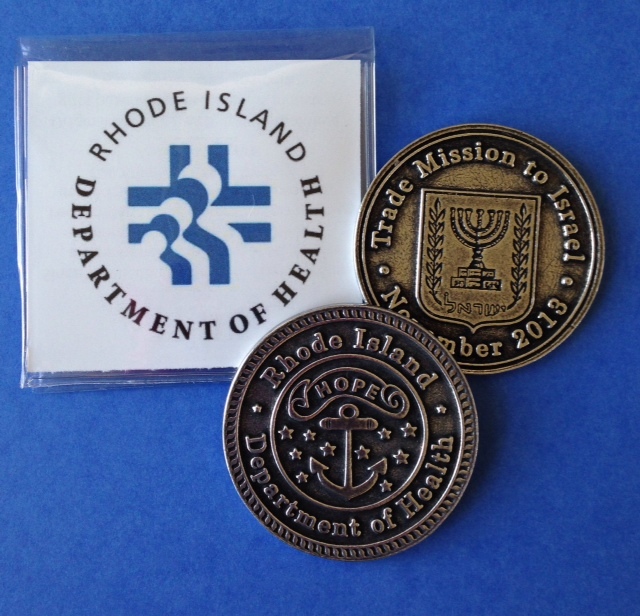 One side of the coin artfully portrays Rhode Island’s anchor seal-a symbol of hope-while the other depicts Israel’s sacred seven-branch menorah, gracefully framed by a laurel. To find out more about The Rhode Island Department of Health & CommerceRI (RIEDC), visit their websites.